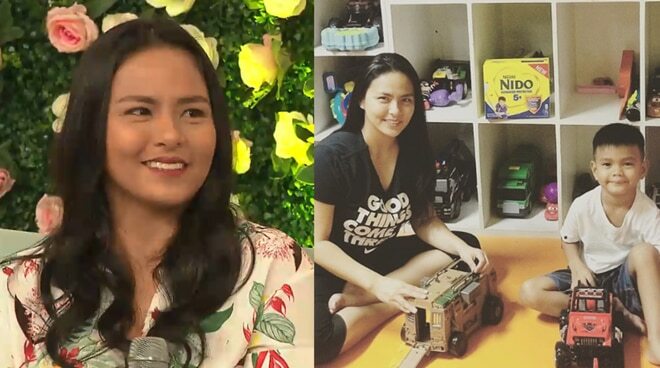 Celebrity mother LJ Moreno-Alapag opens up how she explained to her son Kian that he is adopted in Magandang Buhay's episode on Wednesday, July 18. 'Momshies' Karla Estrada and Melai Cantiveros, together with their guest LJ Moreno, talked about families that are built on love, choice and acceptance in Magandang Buhay's Wednesday episode, July 18. LJ, the wife of basketball icon Jimmy Alapag, shared the adoption story of their son Ian Maximus. Spending some quality with our eldest! It's important for me to squeeze in playtime with our kids even if our days are sometimes so hectic! Since I'm not always with him 24/7, I sometimes worry about him getting exposed to too much grime and dirt from all the playing! But knowing that he gets support for a strong immune system, I know I've got nothing to worry about. I just whip up a glass of Nido 5+ for him that's loaded with Iron, Zinc, Selenium Vitamin A and Vitamin C that help support his immunity, and then I'm confident that he can play as much as he can! Letting him, enjoy, and giving him the freedom to be is my own little way of showing #LoveThatProtects. How about you mommies out there? What's your story on showing #LoveThatProtects to your kids?" LJ said that she always has the heart for kids and orphans, “I think ever since, mahilig talaga ako sa bata at may heart ako sa mga orphans… Kumbaga hindi na rin bago sa akin kasi sa side nila mama, may mga adopted din." She shared how she and Jimmy guided Ian through understanding the situation. “Ever since he (Ian) came home, nagfi-frequent kami sa shelter kasama siya, so although 'di pa siya nagsasalita noon, he knows na doon siya nanggaling. We don't have to say na ‘You’ve been there,’ siya mismo." “Ang advice sa amin ng social worker, 'pag dumating yung time na mag-ask siya, isang tanong, isang sagot muna. If you’re asked kung galing ba siya sa tiyan mo, 'wag yung “No, because you know you came from...” she added as she gave tips to other mothers who have adopted kids. “'Di ko matandaan kung ano pinapanood namin, basta Keona said something like, 'Mama I remember when I was in your tummy' tapos si Ian din sabi, 'Yeah mama, I was in your tummy too, right?' Ang sabi ko lang, 'No...' tapos siya na 'yung sumagot 'dun, buti na lang nga kasi 'di ko alam pano pa, parang napa-stop ako, (pero) siya na mismo sumagot na 'Ah yeah. I remember ‘cause I came from the shelter, like my friends,” LJ narrated. According to her, she found out that she’s pregnant with Keona a few days after adopting Ian. She also shared how she handled comments from other people. “I remember 'yung mga tao would tell me… ‘Ay pag nanganak ka, alam mo mag-iiba yung feeling mo (sa adopted son) ‘dun mo talaga makikita’ pero I can honestly say na when I gave birth to Keona, walang pagkakaiba, kung anong love namin kay Ian noon, kay Keona, kay Caleb, pantay-pantay, pare-pareho."